Last year we received thousands of donated children’s bicycles from Halfords. It’s easy to understand the value of adult bikes in Malawi; grown-ups need to get to work and transport goods. But we’re often asked, and we even question ourselves, about the value of children’s bikes. This story of Brian and David really brings home the huge value of us sending children’s bikes too. They are sold low-cost at Beebikes, all of the money raised from the sale of bicycles funds the vital work carried out by Mother Teresa Children’s Centre. 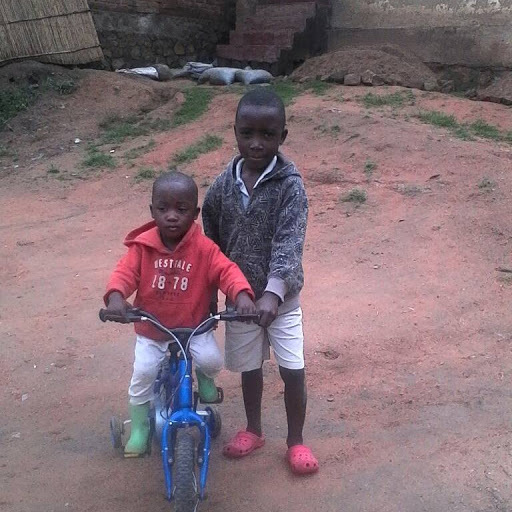 So not only does Brian get to enjoy his bike, thousands of less fortunate Chilomoni children are enabled to have the best possible start in life because of the bicycle sales. David Namuthe is married, aged 25, he works at Mother Teresa Children’s Centre as an Extended Schools Worker. David’s wife Prisca, aged 22, has to work in a café abroad in South Africa because finding work in Malawi is almost impossible. They have two charming boys. Brian is 5 years old, he goes to Mulunguzi primary school in Chilomoni; his brother Luckson is 3 years old and is at a nursery school. With his wife away David must take the children to school each day. School and work start at 7:30am and finishes at 4:30pm and with a one hour walk each way it is a long day. David had a bicycle but the children did not. David decided that now Brian was 5 he could ride a bike to school. David paid for the bike by doing layby. This means each month a portion of his salary was put aside by Beehive. In 4 months he had saved Malawi Kwacha 23,300 which is about £24 and he could finally choose the perfect bike from Beebikes. Brian absolutely loves his bike as he does not have many toys. He enjoys riding to school and likes playing with his friends at the weekends. It is wonderful to be able to share his bike as not many of his friends have one. David and Brian can now enjoy going for a cycle ride together and can go shopping at Blantyre market. It is much better than going on a minibus and they can save the minibus fare which really helps the family finances. George Furnival on Mother Teresa- The Movie!